Hakuhodo Kokutan Finishing LAG – A perfect mix of blue squirrel, goat and synthetic hairs has gone into the making of my perfect finishing brush. This super soft angled head sweeps away unwanted product and softens any harsh powder lines. The angle allows it to hug the contours of my face. I then go back in with a finishing powder to set, blur, perfect my makeup. The handle is ebony wood and comfortable to use. The synthetic hair help maintain the shape of this brush and support the natural hairs . Tom Ford Bronzing Brush – The Tom Ford Bronzing brush is a soft, dense goat hair creation. It is quite large, but it manages to place just the amount of bronzer on my cheeks. The density allows it to then buff the powder seamlessly into place. 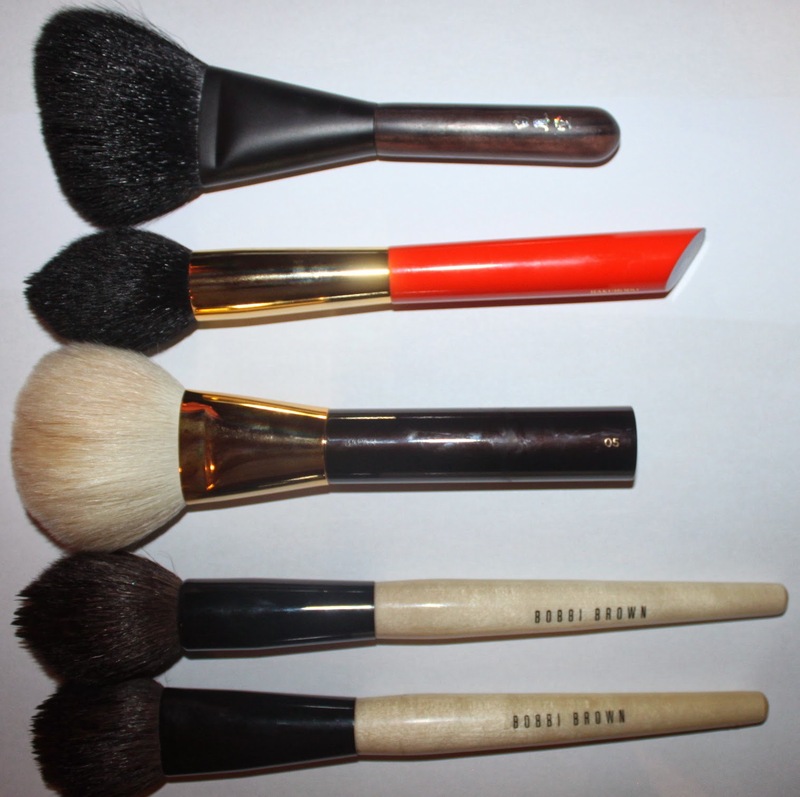 Bobbi Brown Cheek Brush – This came soon after my BB powder brush. It gives a pretty cheek that is not to strong or too soft. Natural hairs again of unknown origin. I have experienced no shedding with either of my BB brushes and they have maintained their shape for quite a few years. Hakuhodo G557 BkSl – A mix of Goat and polyester. An angled brush, with the synthetic hair slightly longer than the goat. I use this with my liquid foundations. it gives a fairly good finish, but does take time to create a flawless canvas. Hakuhodo J210 – This is a natural goat hair brush, which is good for small faces and a more precise application. The round head helps blend any harsh edges. It does produces a natural to strong colour so when using vivid colours such as Tom Ford Narcissus, rather use a less dense brush. Suqqu Cheek – Famous! This is best used with strong cheek colour to create a soft look. It is quite floppy and I do feel the need to go with a firmer brush to blend colour more. Tom Ford Cheek Brush – Tom Ford just does beautiful brushes. Dense goat hair once again. I should use this more often but tend to save it for ‘special occasions. This is daft as it is my favourite cheek brush. A light tap into the blush, tap onto back of hand then onto cheeks – sheer bliss. Ooh lovely collection of face brushes. I would like to get my hands on some I wanted for so long but I keep delaying. I love brushes but feel like I have enough, then again maybe there is one which I really NEED but can't know before trying lol. Tempted by J210. I think have probably have all the brushes I need for the face-but not not all the one's I want! I love my J210- works so well with my new Armani blushes!